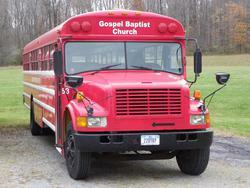 Gospel Baptist Church has a special ministry devoted to people who want to attend church, but lack the means to do so. 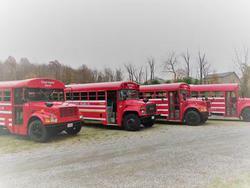 We are blessed with a fleet of bright red busses, all of which pass stringent annual inspections to assure bus operations compliant with state law and passenger safety. Our Bus Ministry travels throughout historic Poland, Mahoning County and portions of Youngstown, Ohio. Our drivers are CDL-licensed and in addition to the driver, a monitor also rides along to assure safety of our passengers. The monitor also leads the riders in songs and distributes special treats when available. To hop on the bus, contact us on Saturday to catch a ride for Sunday School followed by our Regular Sunday Service, after which you will be returned home... or click on the link below.